Naegleria gruberi is a free-living non-pathogenic amoeboflagellate and relative of Naegleria fowleri, a deadly pathogen causing primary amoebic meningoencephalitis (PAM). A genomic analysis of N. gruberi exists, but physiological evidence for its core energy metabolism or in vivo growth substrates is lacking. Here, we show that N. gruberi trophozoites need oxygen for normal functioning and growth and that they shun both glucose and amino acids as growth substrates. Trophozoite growth depends mainly upon lipid oxidation via a mitochondrial branched respiratory chain, both ends of which require oxygen as final electron acceptor. Growing N. gruberi trophozoites thus have a strictly aerobic energy metabolism with a marked substrate preference for the oxidation of fatty acids. Analyses of N. fowleri genome data and comparison with those of N. gruberi indicate that N. fowleri has the same type of metabolism. Specialization to oxygen-dependent lipid breakdown represents an additional metabolic strategy in protists. Bexkens et al. 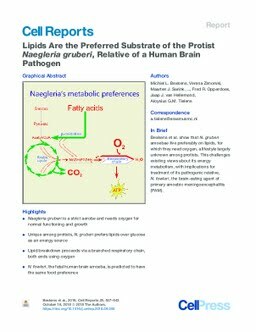 show that N. gruberi amoebae live preferably on lipids, for which they need oxygen, a lifestyle largely unknown among protists. This challenges existing views about its energy metabolism, with implications for treatment of its pathogenic relative, N. fowleri, the brain-eating agent of primary amoebic meningoencephalitis (PAM).